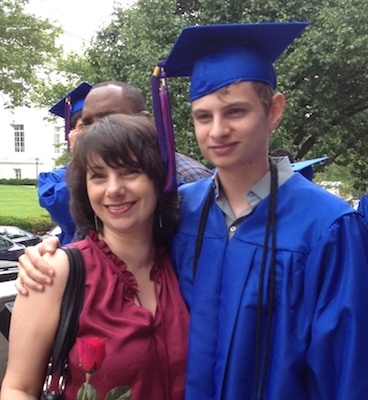 As the mother of a college-age son with a serious illness, the unknown was a terrifying place. Unfortunately, the unknown was also a place where I spent a lot of time. There was a diagnosis for Robby’s illness, but it took such an unusual path that I felt like we were always wandering in an endless maze of options without a map. This uncertainty undermined everyone’s understanding of what was going on, and obscured our expectations of what would happen in the future. The path was full of surprises that kept me off balance and on perpetual high alert for the next problem. I craved certainty, to know what would come next. This was more than my usual detail-oriented, list-loving self. I believed that if I could control the variables, then I could protect my son. I was a perpetual problem solver and a relentless advocate — researching and learning, scheduling and monitoring, cajoling and pushing — all in service of getting the next answer. And it was worth it. I truly believe that my advocacy helped all of us. Professionals were more invested and responsive. Things moved faster and more smoothly. However, I also learned that answers often led to new questions, and the pursuit of answers didn’t always make Robby feel better. I had the power to uncover options, but I did not (and neither did doctors!) have the power to be sure of their outcome. Uncertainty was a double-edged sword shaped by my deepest fears and my most profound hopes. Would the next outcome fulfill the fear or the hope? It was incredibly frustrating and frightening. With practice, I learned to live with uncertainty by working to distinguish between the knowable and the unknowable. Things that were knowable included: What treatments are available? How are they intended to help? What are the potential risks? Things that were unknowable included: Would this treatment work? For how long? At what cost? With that distinction, my goals came into sharper focus. I needed to listen to my son, and to support him where he was. I needed to hear what was most important to him. Sometimes we most definitely did not agree. In fact, some of Robby’s priorities truly tested my resolve. Determined to maintain his autonomy even as his illness accelerated, Robby insisted on remaining at college in a city two hours away. At that moment I only wanted to bundle him up and bring him home, even though there really was nothing I could do differently for him at home. The doctors agreed it was safe for him to stay at school as long as his condition was stable and he was vigilant with his treatment plan. So my husband and I gritted our teeth, and decided that Robby’s independence and confidence in our support was more important than our anxiety. This was not easy. Ok, it was excruciating. My mind raced with “what ifs…”, and my heart broke as Robby struggled stubbornly on his own. But I admired his determination in the face of all of that uncertainty. Robby was not consumed with seeking answers about what would happen next. He concentrated on preserving the present as much as possible. Staying at school meant he could spend more time like any other young guy enjoying his independence with friends, and classes, and possibilities. Eventually, Robby’s health became too compromised, and he had no choice but to come home. After months of bad outcomes, the uncertainty I feared was distilled into a single question: Would this illness take his life? And even then, the answer was unsatisfyingly vague. Probably, yes, but it was impossible to know how or when. So I took my cue from Robby’s determination to stay in the present. Take each day as it comes, try to enjoy the good ones, and remember that the bad ones are also temporary. The only certainty we held was that there wouldn’t be enough days, and that was a certainty I did not want. You can read more from Caryn Anthony on Medium. Her blog “Any Way the Wind Blows” is geared for families with a child managing a significant medical condition.